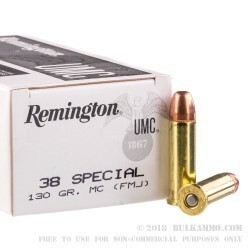 This cartridge is a simple and straightforward .38 Special load that features a copper clad lead cored 130 grain full metal jacket projectile that is a light load by .38 Special standards and offers mild recoil and accurate, easy shooting. The reliability of the round is better than average, and the price point is very compelling, considering the name and the history of the brand/line. This is generally best suited for functional testing, range and target practice and general plinking. It is not a particularly heavy load, and doesn’t offer a ton of ballistic performance for your .38 Special. 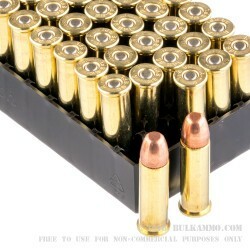 This is a 1000 round case lot purchase that packages the ammunition into 4 250 round boxes. 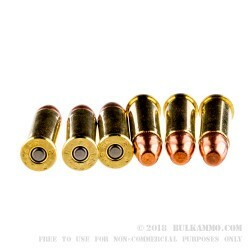 The ammunition is suitable for use in any .38 Special marked chamber/cylinder. Remington and UMC (Union Metallic Cartridge Company) have been doing business for more than 100 years under the Remington brand name; before that, each company had been providing ammunition to consumers for far longer. 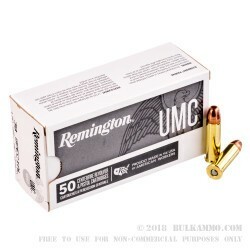 Since 1912 though, the UMC line under the Remington brand name has offered top quality ammunition for a good price point. The inherent reliability in part has built Remington’s stellar reputation. Picked this up for range ammo for my Tarus .357 and my wife's S&W Bodyguard. Blew through 500 rounds, very consistent loads, no misfires. Also very important, this is pretty clean ammo, not much of a chore cleaning the guns after the range.